The recent bout of exchange rate depreciation in the run-up to the snap elections has rattled markets. The weak lira contributes to financial instability risks via high inflation and rising corporate debt service costs. Export-oriented sectors are, to some extent, sheltered by natural hedges and a relatively sound banking sector. Nonetheless, foreign trade partners face reduced import demand from Turkey and higher payment risk. Turkey has been in the spotlight frequently over the past couple of years. The rapid succession of developments started with the failed coup attempt in July 2016, which led to a drop in economic confidence and a brief economic contraction. It set the stage for a constitutional change in which the President will obtain more executive power. This change was endorsed by a narrowly won referendum last year and will become effective after the snap elections. Meanwhile, the Turkish economy benefited from a swift and strong fiscal policy response consisting of tax breaks, employment incentives and credit support measures. This led to a V-shape recovery, and Turkey registered an impressive 7.4% real GDP growth rate in 2017. Developments have taken yet another turn, as the Turkish economic engine is clearly overheating and is starting to falter. The output gap turned positive and inflation is stubbornly high. Headline inflation at 12.15% in May is far above the central bank target of 5%. The fact that core inflation is even higher than headline inflation reflects the impact of strong domestic demand. Inflation is also being driven upwards by the currency devaluation via higher import prices. In the run-up to the snap elections fresh fiscal stimulus measures were introduced to bolster economic sentiment. Economic momentum, however, is now showing signs of slowing. Previously pumped-up private sector credit growth is deflating. The manufacturing purchasing manager index (PMI) fell below the 50 point threshold in April and May 2018, indicating a contraction of activity. Oxford Economics projects real GDP growth will slow to 4.0% in 2018. Regardless of President Erdogan's quick victory in the first round of the general and presidential elections held on June 24th, turbulent economic times will be far from over. A hard-landing scenario is even possible as Turkey’s boom periods are often followed by busts. Gradually cooling a seriously overheated economy is a balancing act requiring some implicit alignment between fiscal and monetary policy that has been missing so far. The current situation in which belated aggressive monetary policy actions of the central bank are trying to compensate for excessive fiscal stimulus by the government is not an optimal policy mix. Another bout of exchange rate volatility, followed by capital inflows drying up, are the most likely triggers for a hard-landing of the Turkish economy. Turkey is known to be resilient to bouts of market stress and exchange rate pressure, but also to be very vulnerable if at some point financial markets decide to finally turn their back on the country. Because of its low savings rate Turkey’s economy is highly reliant on capital inflows, which in Turkey’s case are mainly of short-term and volatile nature (i.e. portfolio investments). The latest episode of credit-driven growth has added to the high external financing needs. Since the country is a large oil importer, higher oil prices will add to the widening of the current account deficit, which is expected to grow to 7.1% of GDP in 2018. After a relatively stable year in 2017, the exchange rate came under renewed pressure in 2018, partly as a result of the monetary policy tightening cycle in the US and geopolitical tensions. Some controversial economic policy statements voiced by the administration that fueled doubts about central bank independence added to the more than 20% nominal depreciation of the lira versus the dollar in 2018. The freefall of the lira finally ended when the central bank raised rates by 300 bps in an emergency meeting and presented a simplification of its multi-rate monetary policy framework. This was quickly followed by another 125 bps rate hike at the regular meeting, lifting the policy rate to 17.75%. 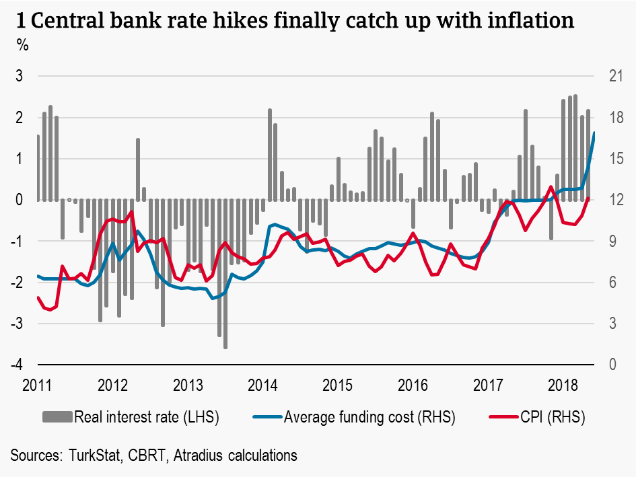 As this more than offsets the surge in inflation and finally increases real rates significantly (see chart 1), it may remove the markets perception that the central bank is behind the curve. Nonetheless, as long as inflation remains high and monetary policy remains exposed to political pressure and to US Fed rate hikes the risk of further depreciation will remain. Lira depreciation is bad news for Turkish trade partners. While a cheaper currency makes Turkey more cost competitive versus international trade partners and supports Turkish export growth, demand for more expensive import products should start to decelerate from its current high growth rate. The depreciation of the lira has already pushed the average annual import price up 25%. Based on past experience, this will eat into Turkey’s import growth with a lag of about half a year. Additionally, the expected slowdown of the Turkish economy will further dampen import growth. The EU as a whole is still Turkey’s largest supplier, accounting for about 37% of Turkish imports, and could turn out to be the most affected. 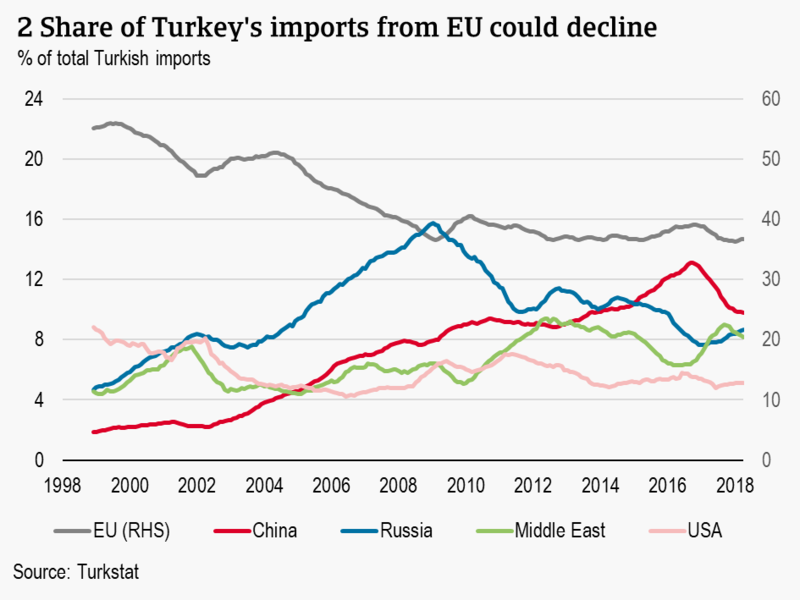 With higher import prices across the board, Turkey may further shift its demand away from Europe towards cheaper Chinese, Russian and Middle Eastern imports. It seems a good opportunity to re-ignite the upward long-term trend in the share of imports from China (see chart 2) and would also suit Turkey’s diplomatic efforts that seem to have turned eastward. Especially since negotiations to modernise the customs union between Turkey and the EU seem to be stuck. Besides expectations of weaker demand from Turkey, trade partners in Europe should worry about the financial health of the Turkish companies with which they do business. External debt, which is mostly held by the private sector (i.e. banks and corporations), is considered sustainable by the IMF, but the level is high. Turkey’s total foreign debt exceeds 200% of exports of goods and services. Moreover, debt is susceptible to interest rate, rollover and exchange rate risks. The IMF calculates that if there is a permanent real depreciation of the lira of 30%, debt would exceed 80% of GDP by 2023. Non-financial companies in particular run a substantial currency risk with about half of their total loans (close to 70% of GDP) being denominated in foreign currency, while foreign exchange (FX) assets only cover about 40% of FX liabilities. Based on the extent of the lira depreciation in H1 2018, an increase in the net FX position by about 5 percentage points to above 30% of GDP could be extrapolated (see chart 3). However, roll-over concerns are somewhat mitigated by the fact that most corporate FX debt is long-term, with maturities of over 5 years. Although short-term corporate FX liabilities are non-negligible at 12% GDP, they are entirely covered by short-term assets. The impact of the lira depreciation via the financial channel requires a sectoral view. A drop in the value of local lira earnings makes repaying dollar denominated loans more difficult for highly indebted non-financial corporates. This impacts certain sectors more than others. 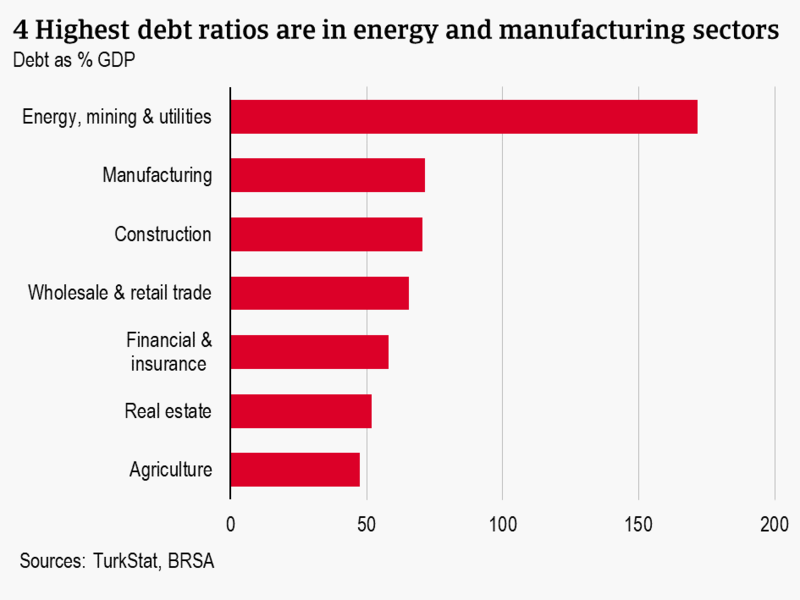 It turns out that the sectors with the highest debt ratios – namely energy and manufacturing – are exactly those sectors that are most relevant for Turkey’s main trade partners, as the largest share of Turkish imports fall into the related product categories of crude materials (including fuels), chemicals, machinery & equipment and basic manufacturing (see chart 4). Risk profile data of the banking system show that the foreign exchange share of debt in these sectors is also the highest. The same applies for the tourism industry, including hotels and accommodations. The reason that such high FX exposure has not yet translated into significantly higher non-performing loan (NPL) ratios could be that these export-oriented sectors are more inclined to have a natural FX hedge than domestic sectors such as wholesale & retail. 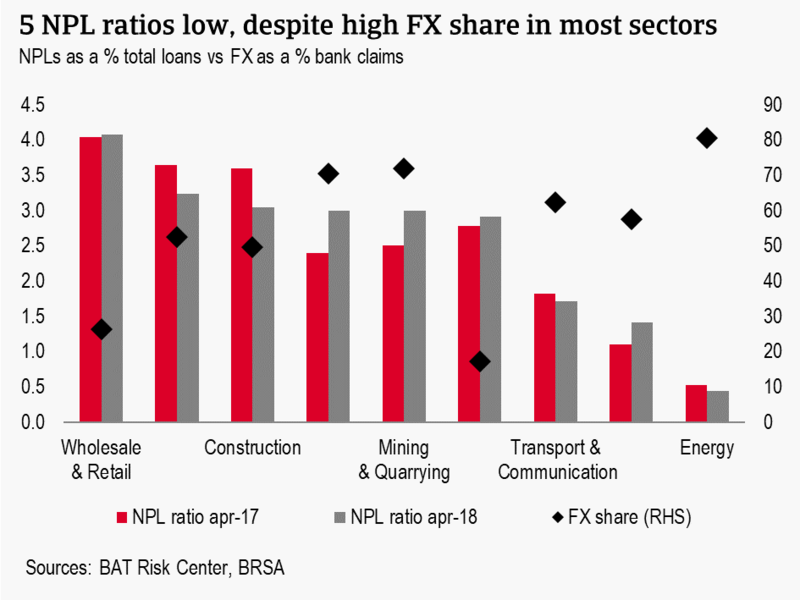 In fact, NPL ratios are the highest for the domestic wholesale & retail sector and the lowest for the most indebted and FX exposed energy sector. Moreover, across sectors NPL ratios are still low and have not shown a consistent increase over the past year (see chart 5). Although the ongoing lira depreciation has not caused widespread problems yet, the first cases of Turkish corporations in financial trouble have emerged. Two large multinational corporations – Dogus Holding and Yildiz Holding – have asked banks for billions of US dollars for debt restructuring. This could be the tip of the iceberg. That said, Turkish banks are still in relatively solid shape and are not directly exposed to FX risk themselves, since they are not allowed to carry net open FX positions. The banking system is well regulated and well capitalized with a capital adequacy ratio of 16%. Stress testing by the IMF in the 2017 Financial Sector Assessment Program indicates that the banking sector is resilient to adverse shocks. Only in the case of a deep and protracted recession would capital needs arise. In such case, low government debt of below 30% of GDP leaves some room for sovereign support. However, there are two indirect ways that banks could be hit by persisting lira depreciation. One is – as discussed – via increased default risk for corporates that hold FX debt. This would increase non-performing loans. 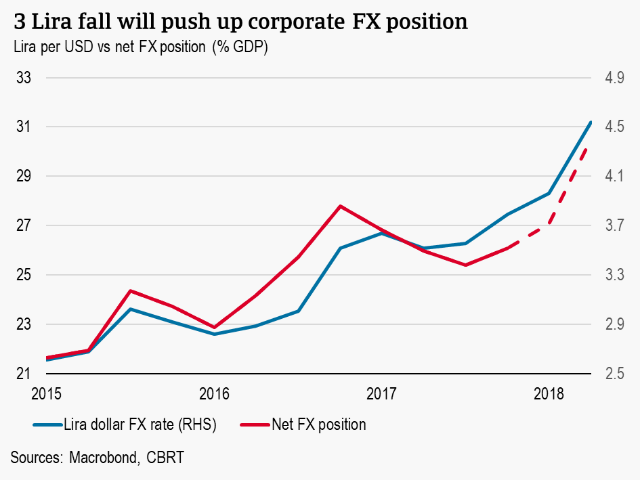 The second and more disruptive way is when Turkish banks start having difficulty refinancing the substantial amount of short-term FX funding that they rely on to extend domestic credit. The high lira loan-to-deposit ratio of 148% in 2017 emphasizes the high reliance of banks on external market funding. Turkish commercial banks hold around USD 76 billion of short-term external debt, which makes up around 10% of their total liabilities. They are therefore susceptible to rising global interest rates and the possibility of a sudden stop of capital flows to Turkey. The Turkish central bank, is trying to address these risks, not only by finally stepping up its monetary tightening policy, but also via recently introduced measures to restrict FX borrowing by SMEs, that do not have natural hedges, and by providing a lira-settled hedging instrument. However, this does not address the fundamental problem of a low savings rate and weak productivity growth. It would be good for the Turkish business climate if, after the elections, priority is finally given to structural reforms. In some major industries payment behaviour has deteriorated, with extended payment terms and an increased number of payment delays. Turkish business insolvencies remain on an elevated level, with 80% of newly established businesses failing in the first three years after their set-up. That said it must be underlined that even in industries severely affected by the current situation there are still many strong and resilient companies. Despite lower domestic car sales in 2017 and early 2018 the industry has kept up so far, mainly due to higher exports to the EU. The weaker Turkish lira has helped export-oriented Turkish car producers and suppliers (automotive is Turkey´s largest export sector), as exports increased 17% year-on-year in the first five months of 2018. Gearing and financial requirements of businesses are average, as supplier support, rather than bank finance, is usually sought in this sector. Payment duration in the automotive sector usually ranges from 30 days to 60 days, and the payment behaviour is still stable. However, foreign exchange risks, fierce competition, high taxes and the plethora of undercapitalised businesses pose downside risks. Higher import costs due to the recent depreciation of the lira are having a big impact on automotive businesses that heavily rely on imports of car parts, but have just limited or even none export opportunities. 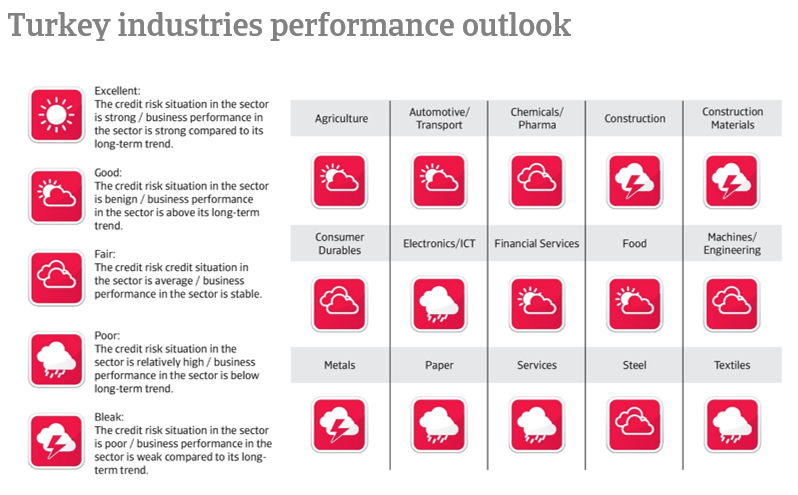 The chemicals sector is impacted by a slowdown in construction activity, less demand from plastics and textiles buyers and increased economic volatility. A deterioration of margins cannot be ruled out, as this mostly domestic market oriented and import-dependent industry has been affected by the sharp lira depreciation. The oil-dependent petrochemical sector is the most impacted by commodity price volatility and currency depreciation. On average, payments in the Turkish chemicals sector take 100 days to 180 days. Both non-payments and insolvencies are expected to increase in the coming months, as lower sales and the lira depreciation have negatively affected the liquidity of businesses and payment behaviour. Pressure on the financial strength of chemical businesses is exacerbated by the interest increases to combat inflation, leading to higher borrowing costs. Many chemical companies are holding bank loans in foreign currency, making them susceptible to foreign exchange risks. That said, the pharmaceuticals sector is still performing well. Turnover and profit margins are expected to increase in 2018, supported by price hikes passed by the government in 2017 and early 2018. On average, payments in the Turkish pharmaceuticals sector take between 90 days and 120 days. As sales prices for drugs are set by the government, and the Turkish Social Security Institution accounts for 90% of payments, the risk of non-payment is currently low. However, there remains a risk that in order to reduce the budget deficit the government will lower purchasing prices in the short-term future as part of public spending curbs. The Turkish construction sector suffers from subdued activity, especially in the residential building segment, which struggles with lower household confidence and supply overhead. With too many players in the market competition is fierce, leading to high pressure on businesses margins. The situation has deteriorated since the end of 2017 due to higher interest rates and rising commodity prices (especially for rebar). This, together with high indebtedness and weak liquidity of many construction businesses has led to increasing insolvencies in 2017 and 2018. Payment duration in the industry is 120-180 days on average, to and payment experience has been rather bad over the past two years. Due to high indebtedness in the construction sector, many businesses have to provide significant collateral when borrowing. Even some bigger groups that had no liquidity problems in the past are currently facing refinancing issues. Over the past years the Turkish retail sector has benefitted significantly from robust economic growth, a growing population and rising household purchasing power. Year-on-year retail sales growth in Turkey averaged about 7% from 2006 until 2017. While private consumption increased 6.0% in 2017, growth is forecast to slow down to about 3.5% in 2018 amid lower economic expansion. This will impact non-food retail sales growth in 2018 as the sector is already affected by higher prices for imported goods (lira depreciation) and higher interest rates. Non-food/consumer durables retailers structurally face low profitability and thin margins due to strong competition, coupled with high inventory expenses. Many retailers are highly leveraged, while the willingness of banks to provide credit has decreased and interest rates remain high. Retailers with debt denominated in foreign currency are increasingly exposed to default risk due to the ongoing currency volatility. Compared to other Turkish industries non-performing loans (NPL) ratios are the highest in the wholesale and retail sectors (see chart 5 above), and payment delays and insolvencies are expected to increase in 2018. Businesses selling mainly imported and therefore more expensive ICT and consumer electronics products face above average risks. In 2017 machinery production growth was 9.6% higher than total manufacturing production growth, mainly due to a surge in the second half of the year. The sector benefitted from higher capital expenditures and robust exports (up 13.6%), helped by increased demand from the EU and Russia. The capacity utilization rate of the sector increased by 2.8% to 79.2% last year. It is expected that external demand for Turkish machinery will remain robust in 2018, with a further increase in exports. Compared to many developed markets the Turkish machinery industry still benefits from lower labour costs. A VAT exemption planned for the purchase of machinery and equipment in 2018 and 2019 could support domestic demand. While lira depreciation provides competitive advantages for machinery exports, this is partly offset by higher import prices for spare and metal parts. Additionally, higher interest rates and the weakness of some buyer sectors (e.g. textile) have a negative effect on the industry. Payment duration in the machines/engineering sector is usually between 90 days and 120 days, and the level of protracted payments is average. Turkish metals exports increased 9.4% in 2017, to USD 7.4 billion, while imports decreased 5.8%, to USD 4.8 billion. Although export opportunities to Iraq and Qatar have increased for the building materials segment, in the domestic market this segment is severely impacted by the slowdown in domestic construction activity. Increased infrastructure investments in Turkey however, could mitigate the pressure. The metals industry continues to suffer from major structural problems, such as overcapacity and competition from China, high dependence on (more restrictive) bank lending and exposure to currency volatility. Business insolvencies and payment delays have increased over the past two years, due to deteriorating margins and high indebtedness of businesses. The Turkish textiles industry has shown a deteriorating trend in recent years due to a combination of excess capacity, a lack of branded production, low capitalisation, decreasing domestic and export demand and fierce competition from Asia. Many businesses suffer from high indebtedness and weak liquidity, and more than 6% of bank loans are non-performing.